The early bird catches the worm: book your ticket for the deliciously discounted price of £35! 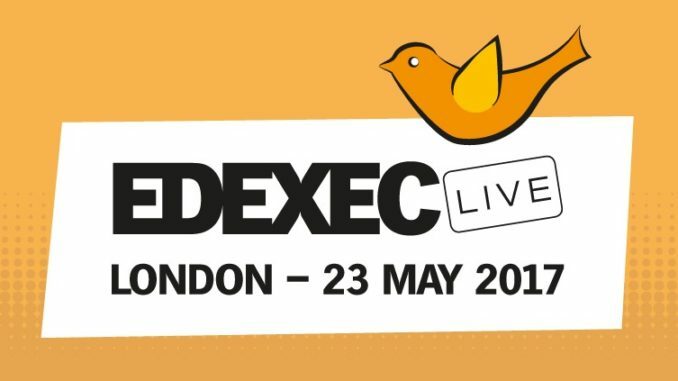 Back with a bang: EdExec LIVE returns to 30 Euston Square, London, on May 23 – will you be there? As they say, ‘The early bird catches the worm’ – so book your ticket today for the deliciously discounted price of £35! There’s no doubt that the education sector is changing and that this is having an impact on those that work within it. There are increased expectations weighing heavily on the shoulders of those in school business management and professional development is key to lightening this burden. It’s difficult to justify a day out of school; that’s why we have built EdExec LIVE to optimise time and maximise learning. We are acutely aware that schools are now required to do more for less, so budget-focussed school improvement is core. Seminars are dedicated to the issues that affect you and your role most. Carefully constructed to provide maximum benefit – they offer insight into topics such as fundraising initiatives; practical bid-writing and employment law issues. Other topics include HR, legal, CPD as well as premises management, finance and ICT – think of EdExec LIVE as a day-long MBA for SBMs. EdExec LIVE is an opportunity to develop your existing skillset and see which direction you might want to take. There are plenty of opportunities at EdExec LIVE; and plenty of opportunity to speak to peers that are considering their next steps, as well as those that have already taken them. Bringing together school business managers and leaders from across the UK – after all there’s no better support than peer support – EdExec LIVE strives to create a hub of school business management innovation. It’s an opportunity to meet local and national colleagues, members of bursar groups and formal and informal clusters, MATs and federations – as well as, share best practice and form long-lasting professional relationships that could benefit you and your school in the future. Sounds like an event that can’t be missed! Book your ticket now. For, further information POP over to our brand-new website!